Like cable companies, streaming services are not immune to raising rates, and the country’s biggest and most popular streaming service — Netflix — this morning announced its largest rate hike ever. Most Netflix subscribers will see their monthly rate increase by $2 a month. 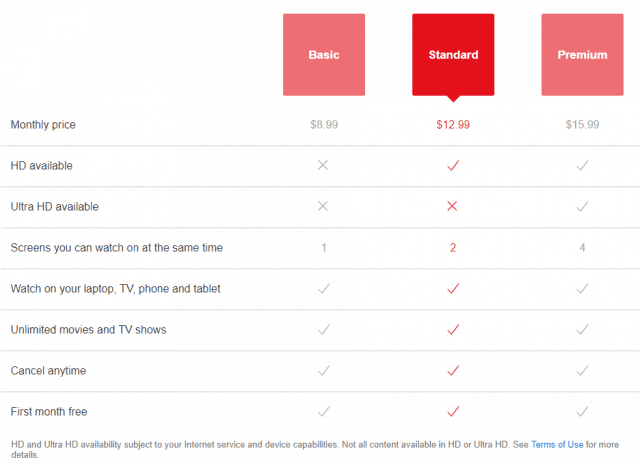 Netflix’s rate card effective January 15, 2019 (for new subscribers). The rate hike will raise at least $100 million a month in revenue and will apply first to new subscribers, and will gradually apply to all 58 million current U.S. subscribers over the next three months, as well as those in Latin America where subscriptions are paid in U.S. dollars (except in Mexico and Brazil, where rates remain unchanged). Rates for the 78 million Netflix subscribers outside of the U.S. are not expected to change immediately, partly due to ongoing promotional spending and marketing efforts to boost subscriber numbers overseas. Wall Street had been increasingly pessimistic about Netflix’s revenue and profit projections because of ongoing increases in spending to finance an avalanche of original Netflix productions. The company’s stock price dropped by 21 percent, from a peak of $423.21 last June to $332.94 just before the market opened this morning. Netflix’s chief content officer told the media last spring about 85% of the company’s estimated $8 billion in content spending for 2018 was for original TV shows, movies, and other productions. By summer, Netflix had $12 billion in debt before borrowing another $2 billion in October. But that debt never changed Netflix’s plans to premiere 1,000 new movies and TV series in 2018, with an even larger number of productions scheduled for 2019. 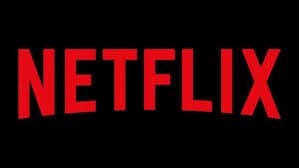 Netflix has been pushed towards producing its own content as movie studios and studio-owned television production companies raise contract renewal prices on Netflix or end those contracts altogether, bringing content back to those studios as they prepare to launch paid streaming services of their own. WarnerMedia, Disney, and NBCUniversal are all planning launches over the next 24 months, while other existing services like CBS All Access and Hulu continue to beef up their own viewing menus, often with shows that were formerly found on Netflix. Netflix is also depending on a growing international audience for its offerings, and has expanded original productions in many languages to find that global audience. Netflix usually benefits from much lower production costs for shows filmed overseas, and English language subscribers have surprisingly embraced dubbed and/or subtitled content at levels beyond Netflix’s expectations. Back in North America, the massive increase in demand for original content by Netflix and its competitors has made it possible for production companies, directors, writers, and talent to command dramatically higher salaries, raising Netflix’s expenses. Investors cheered today’s price increase, causing its stock price to rise at least 6% in early trading. Wall Street believes Netflix is now nearly immune to cancellations over its price, which is still below the monthly retail price of HBO. But this morning’s announcement does represent the largest rate increase ever for the 12-year old streaming service. Netflix will also use some of the additional revenue from the rate hike to pay down its substantial debt. Few expect any backlash reminiscent of Netflix’s 2011 decision to raise prices and unbundle its DVD-rental-by-mail service from video streaming, which resulted in a 60 percent rate increase for customers seeking both streaming and mail rental options. Netflix lost 600,000 subscribers after that announcement, initially making the company more cautious about future rate increases.